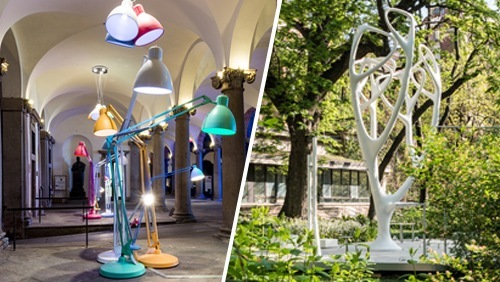 Interni has called on designers of international stature from various backgrounds – Japan, China, Brazil, Russia, Great Britain, Poland – with different types of training and experience, with the aim of forming a mosaic of styles and visions, and to compare, also on a territorial level, the various characteristics and interpretations of design. 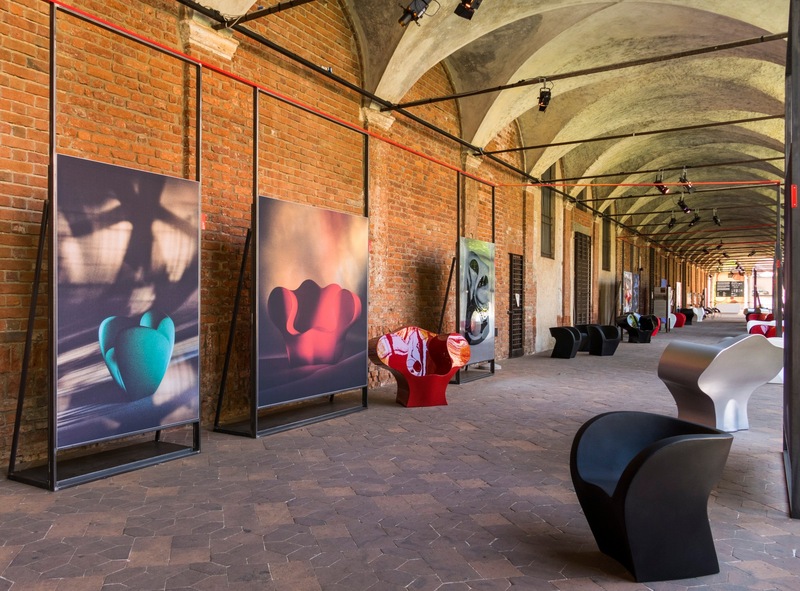 Collettivo Alidem has organized the exhibition L’art de la photographie by combining, in a large black frame, a series of photographic works Alidem has selected and reproduced as limited editions. 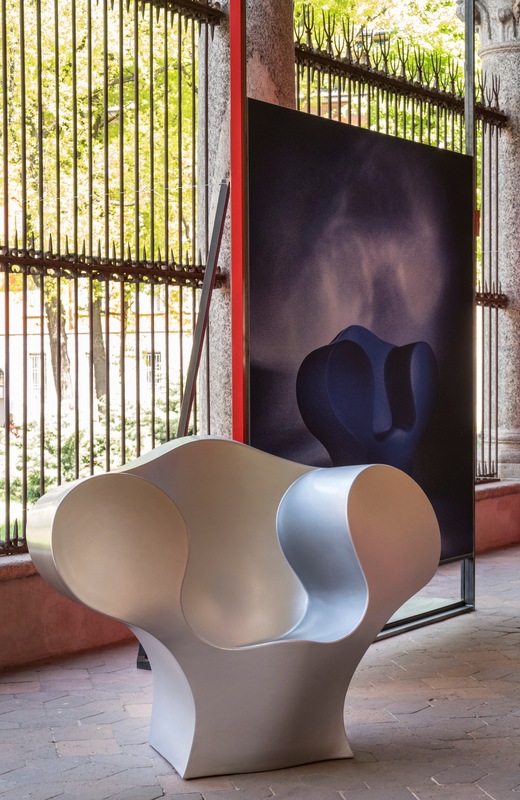 The exhibition has the goal of making the world of photography meet that of design, proposing possible synergies for interior decorating and supporting young or already successful artists. 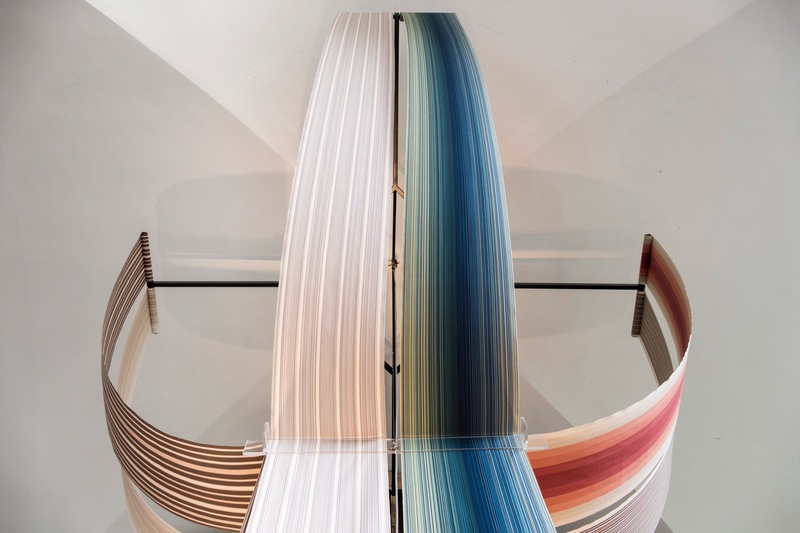 The installation arises as a work in progress, from the encounter between the artist and sculptor Laura Ellen Bacon and the designer Sebastian Cox; it is an experiment to emphasize the qualities of certain types of American hardwood (soft maple, American cherry, red oak). 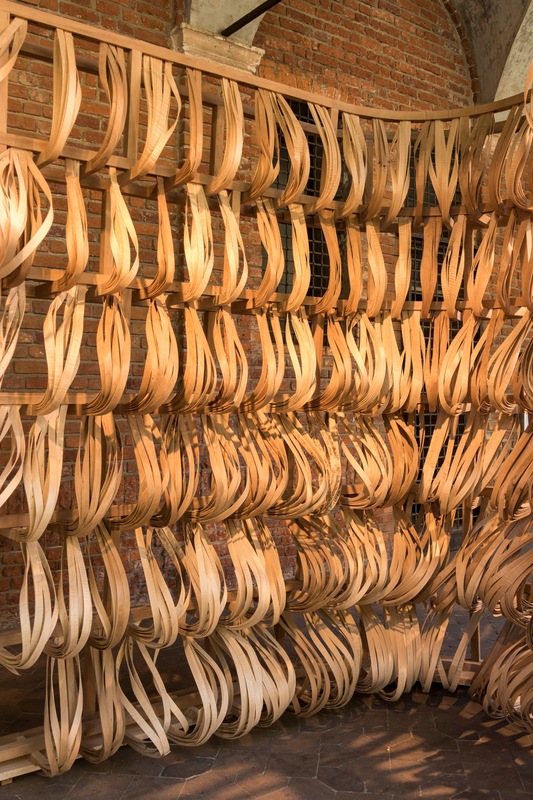 The installation has been produced with AHEC - American Hardwood Export Council, the leading international association of the American hardwood industry. 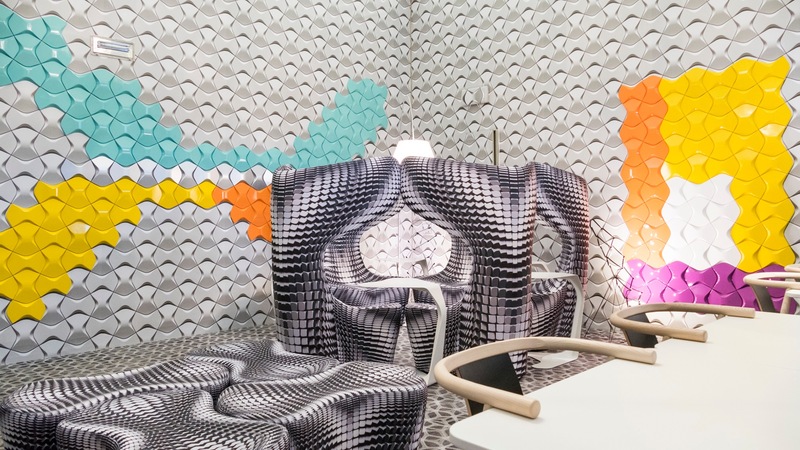 The Conogó divider by Noemi Saga, the Dandi table by Camila Fix (Fix Design), the Cobra Coral chair by Sérgio Matos. 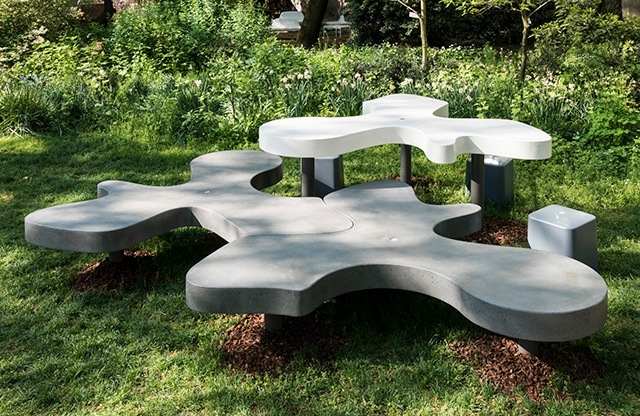 The Niemeyer 1985 table by Oscar Niemeyer for Estel. 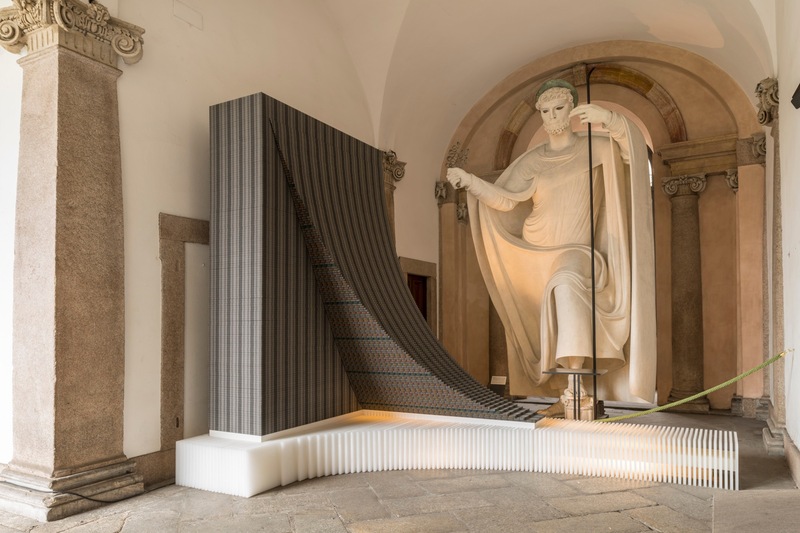 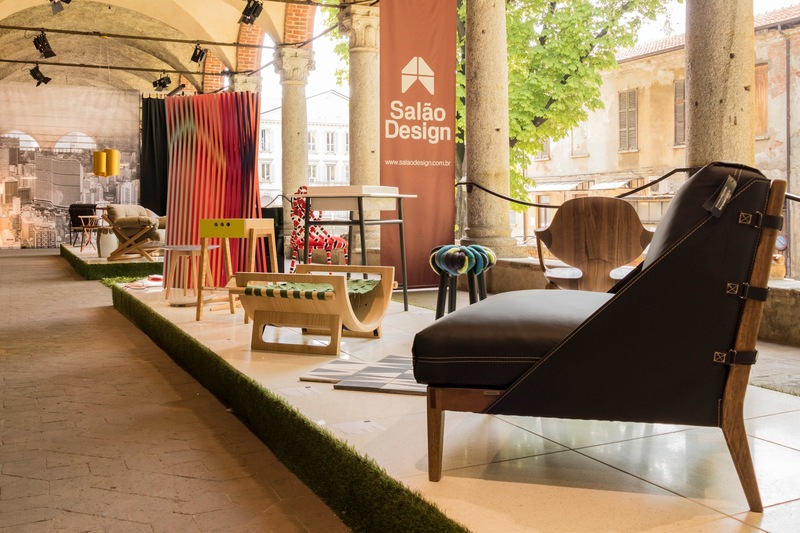 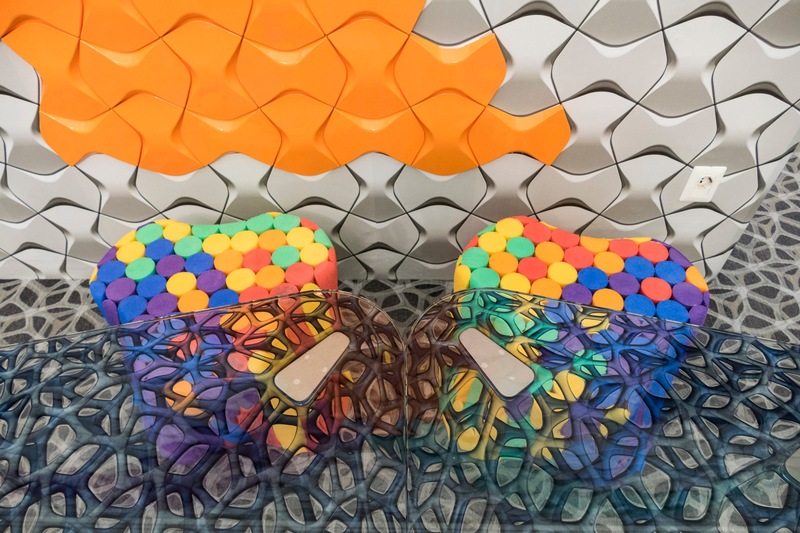 Be Brazilian was the 7th edition of the exhibition with which Brazil S/A takes part in the FuoriSalone in Milan, and the second in the context of the Interni event. 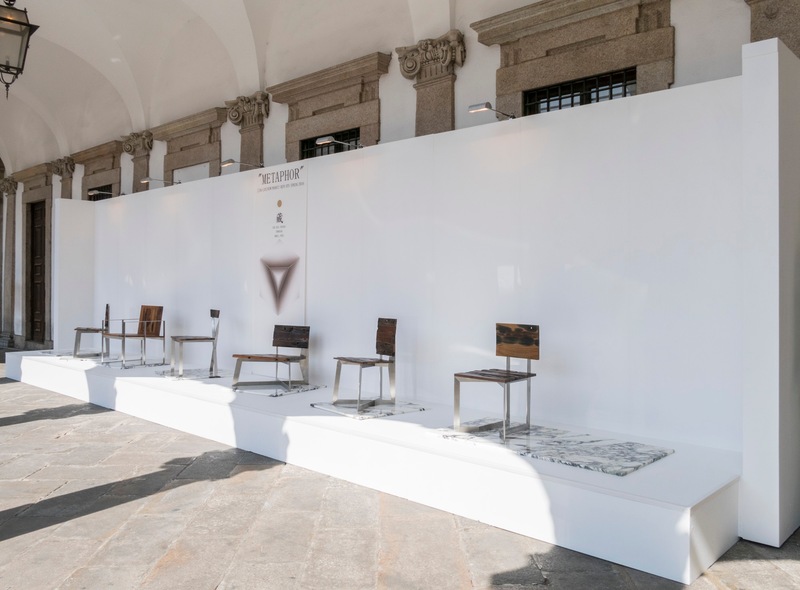 Along the portico San Nazaro the show presented works by about 40 designers and artists, as in a large open-air gallery. 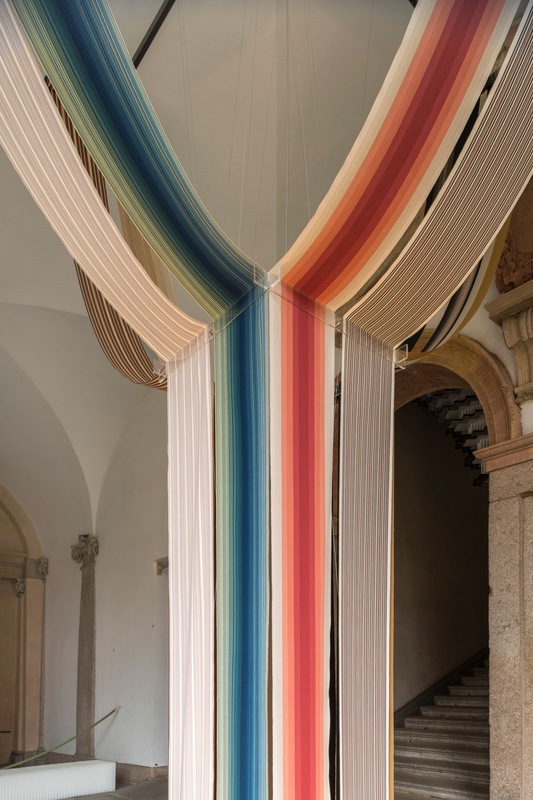 Brazil S/A has the aim of promoting the image of Brazilian design, favoring contact between designers and companies. 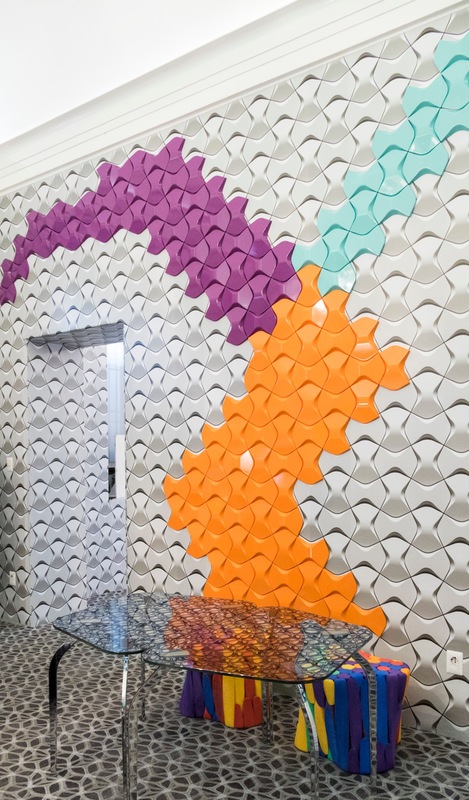 With the collaboration of Angelo Derenze, Fran Abreu and the studio Piuarch. 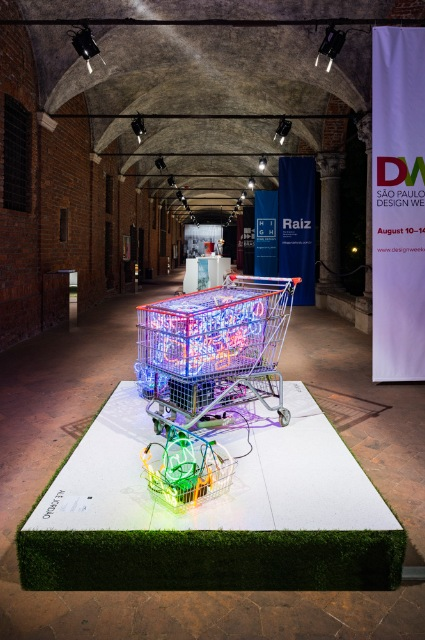 The installation “Trolleys. 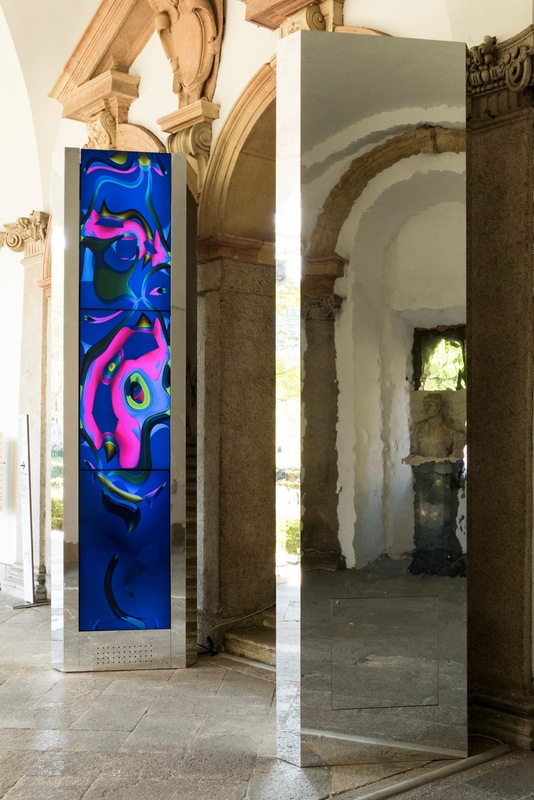 The Neon Traffic Dealer” by Alê Jordão. 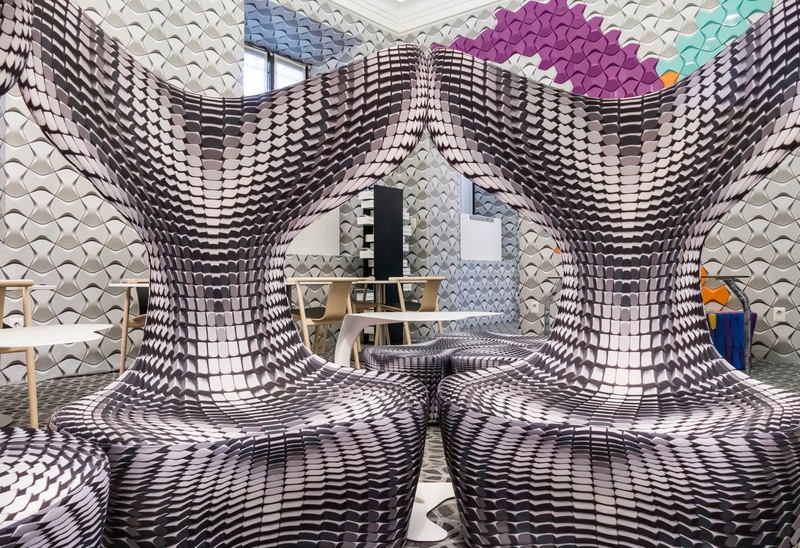 L’ufficio stampa, progettato da Mac Stopa con le aziende Nmc (schiume sintetiche) e Milliken (rivestimenti tessili per pavimenti), si articolava in due zone: l’area reception, arredata con un bancone e dei pouf realizzati con i Comfy® Noodles di Nmc (in questa pagina), e l’area riunioni, con sedute e tavoli della nuova Drum Collection di Mac Stopa per Cappellini (nella pagina seguente). 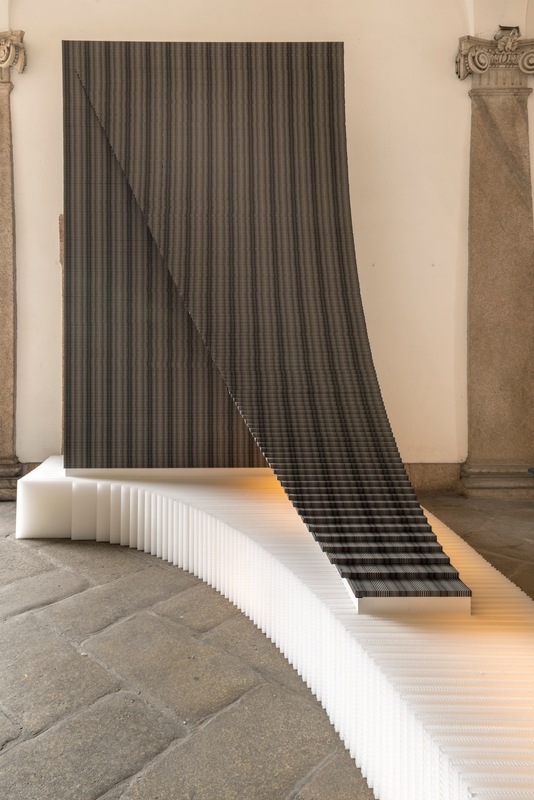 Le pareti sono state rivestite con le piastrelle tridimensionali Arstyl® Wings (Nmc), mentre a terra è stato posato il tappeto a tasselli di Milliken. 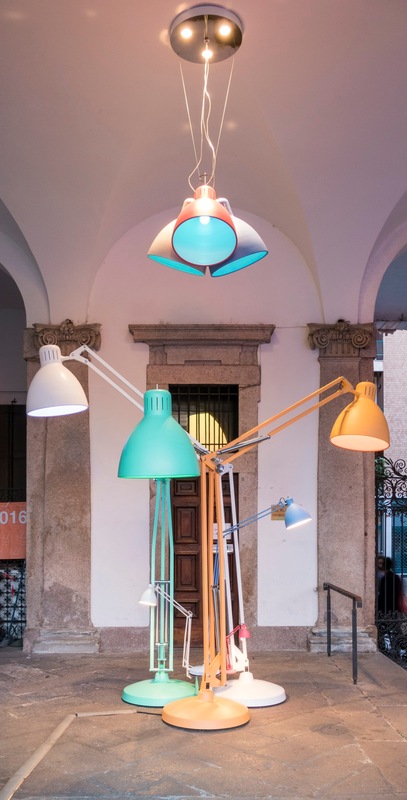 Hanno partecipato anche Marro e Luceplan. 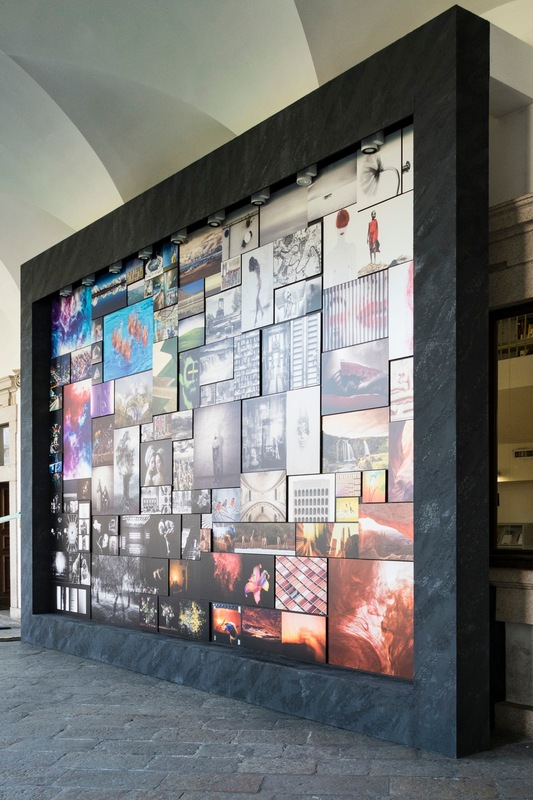 The installation Digital Borders by Felice Limosani on the South Portal featured LED monitors by Panasonic showing graphics to illustrate migratory flows. 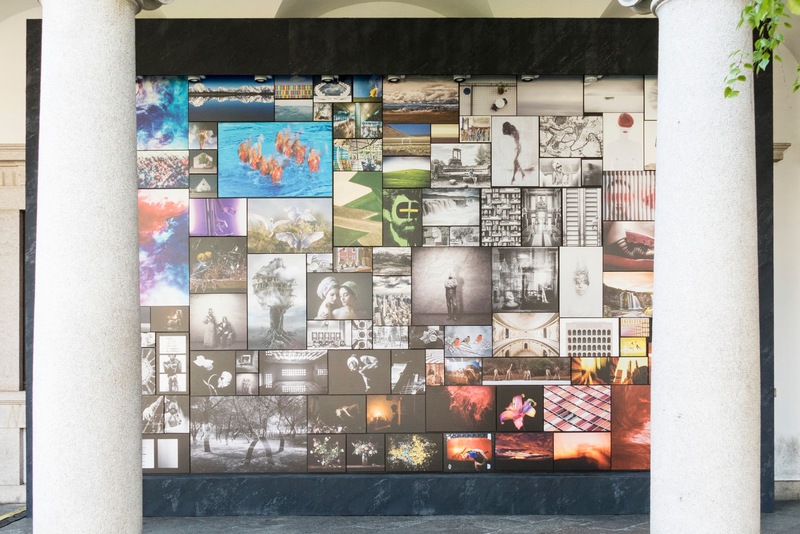 Produced with East End Studios. 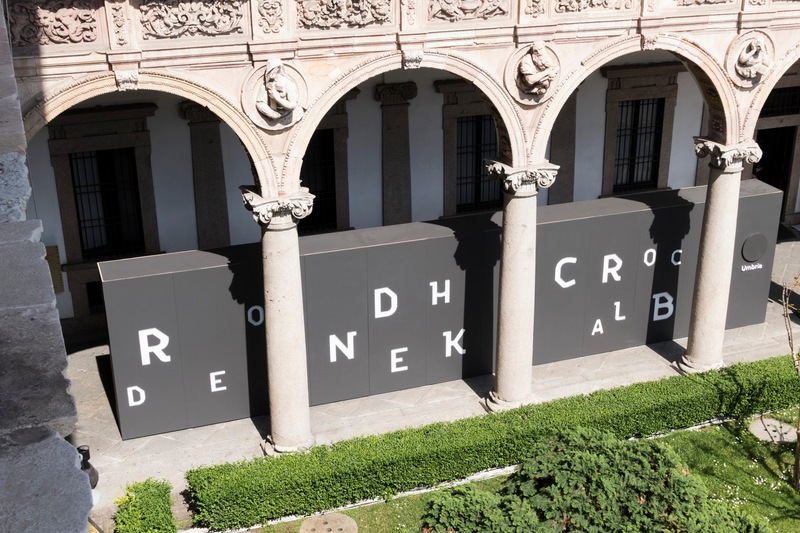 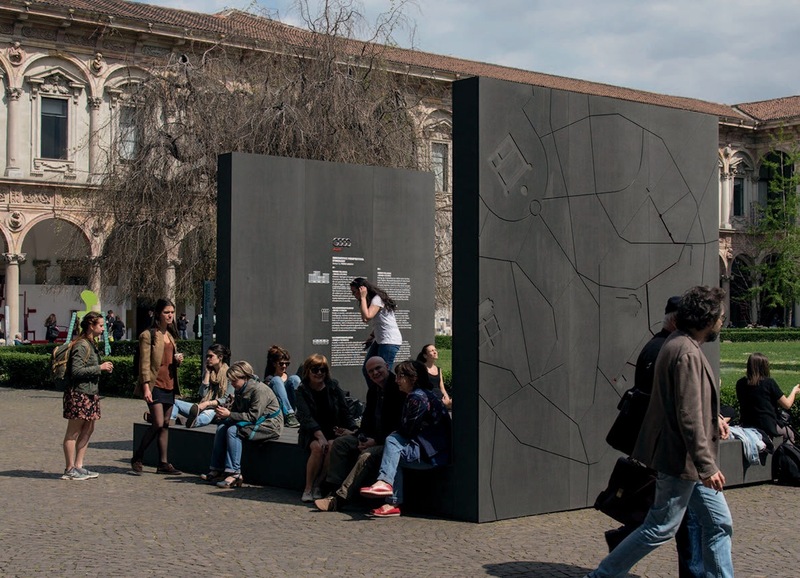 The installation created by Piero Lissoni for Audi and placed in the Cortile d’Onore of the State University was closely connected to three other installations from the same series positioned at the entrance to Torre Velasca and on Via Monte Napoleone, to interpret the four rings of the automaker’s logo. 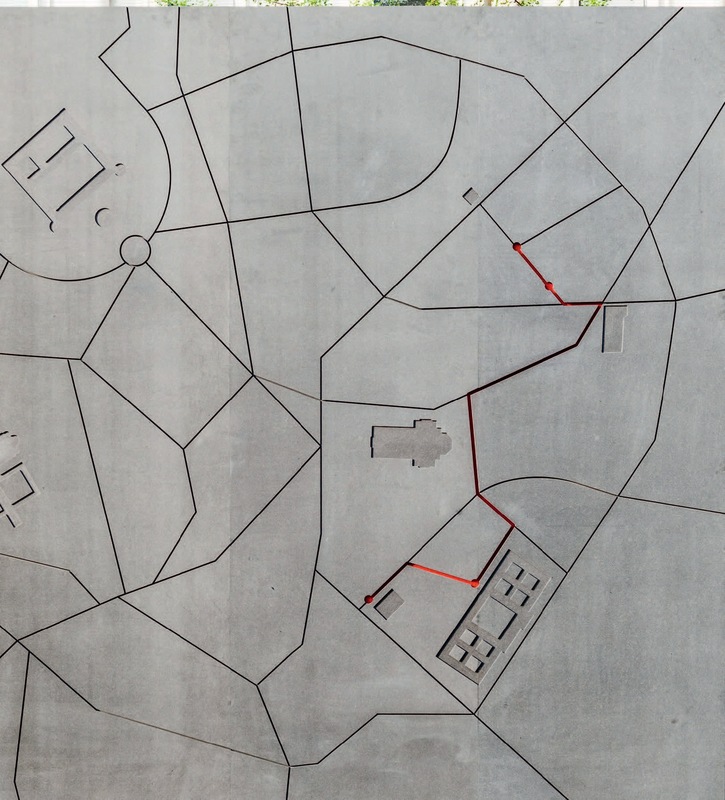 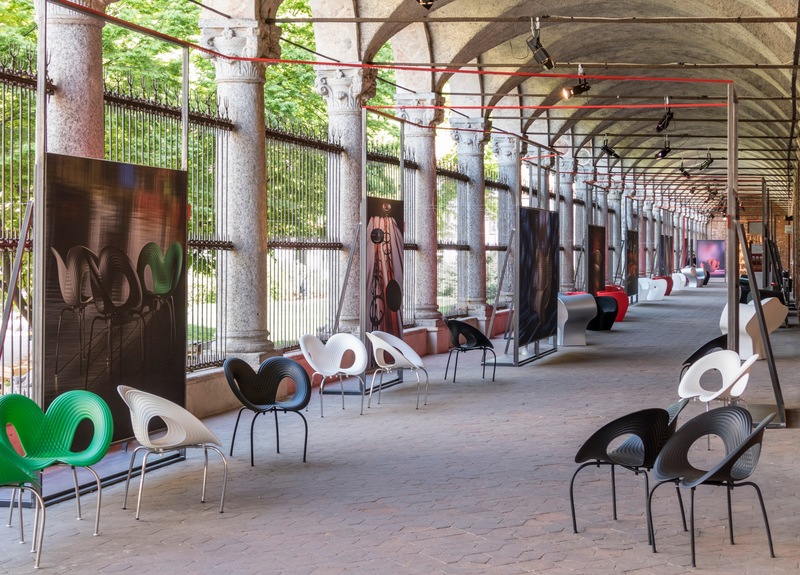 Innovative Perspective: Itinerary was a place of gathering and relaxation, with the aim of providing indications on the position and meaning of the other three installations around the city. 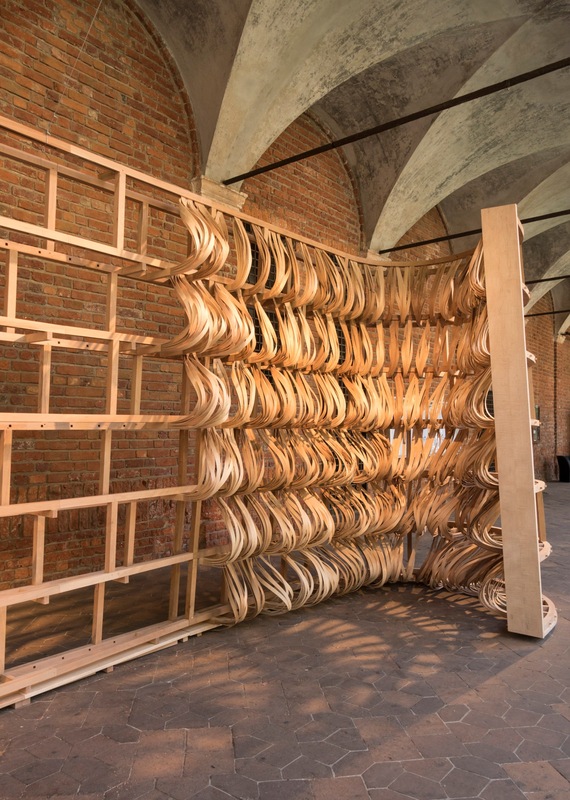 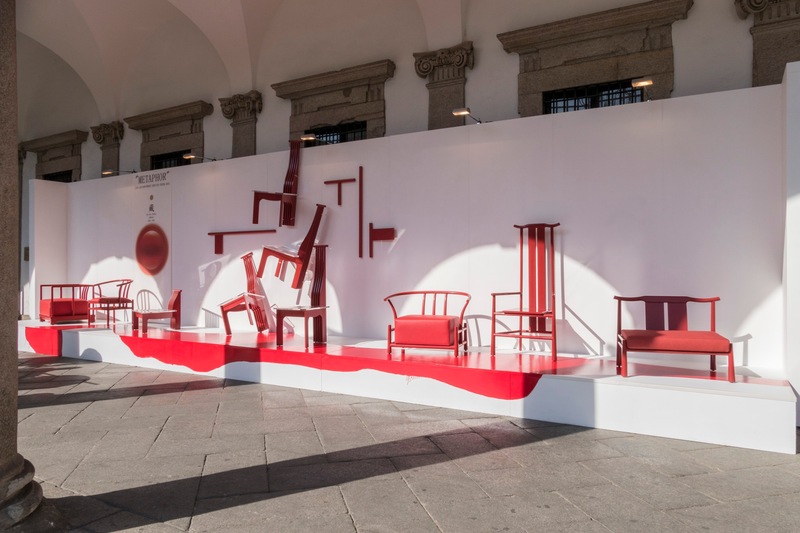 The installation Metaphor in the portico of the Cortile d’Onore featured two displays for two seating collections designed by Chen Xiangjing and produced by Jing Yi Zhi International Furniture Supply, the Chinese furniture manufacturer in which oriental taste meets design, associating tradition and innovation. 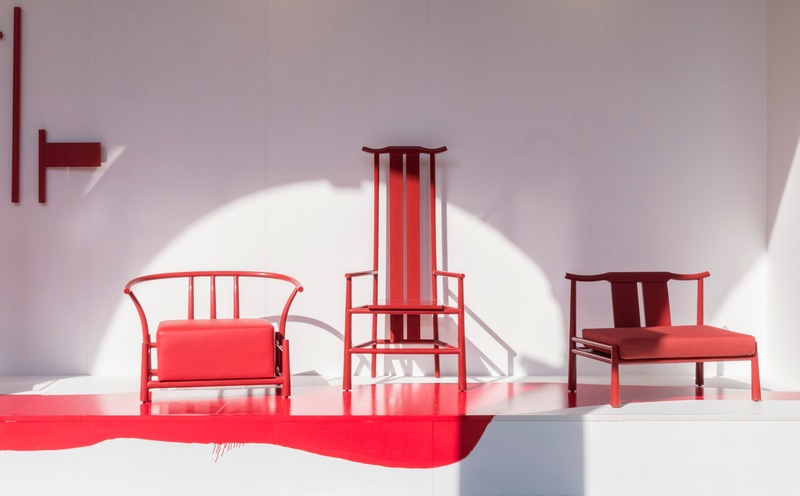 One of the two collections included seats covered with red lacquer, while the other had armchairs with a metal structure and seats in wood recycled from old river boats. 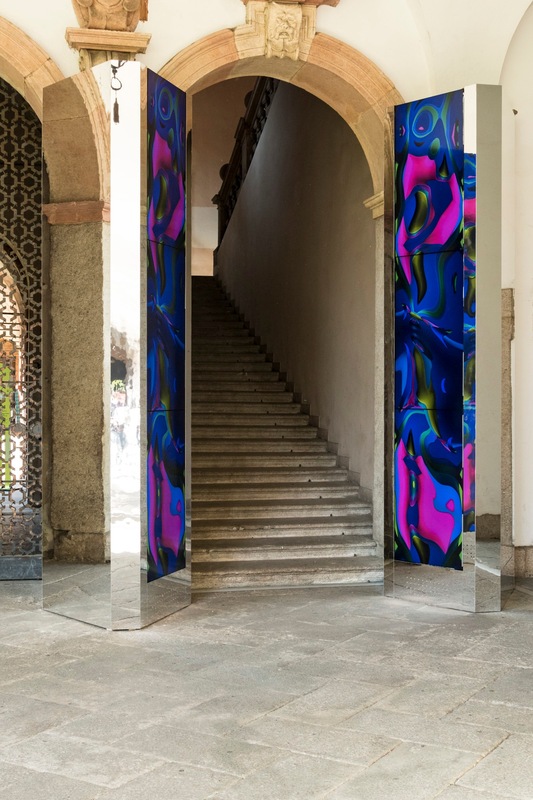 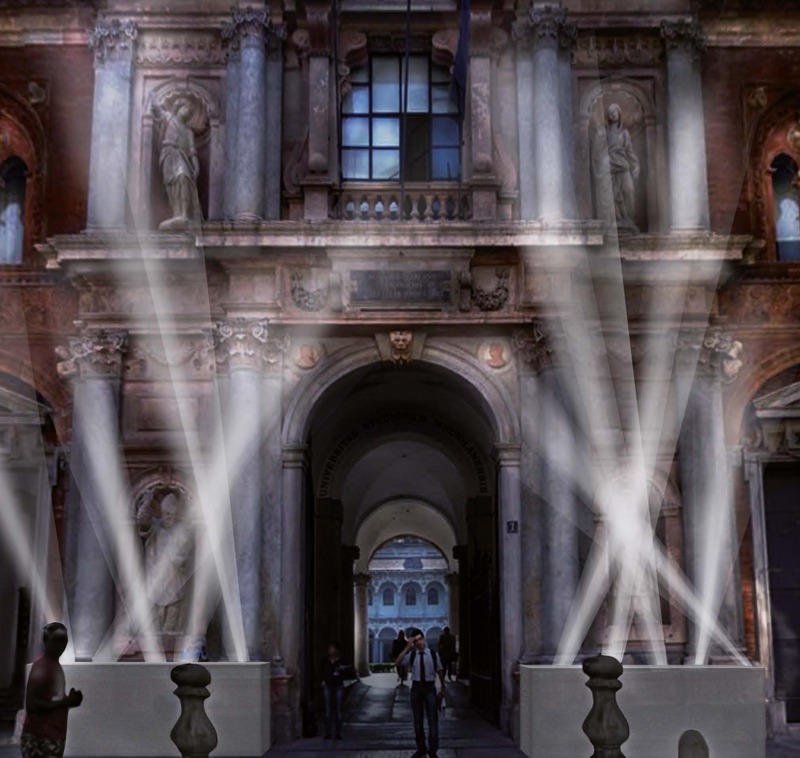 Bands of light directed upward, bowing and rising, intersecting and overlapping, to underline the festival of design organized by Interni in the spaces of Ca’ Granda: ten mobile heads in constant motion, hidden by two boxes at the sides of the gate enhanced by a line of Azul marble. 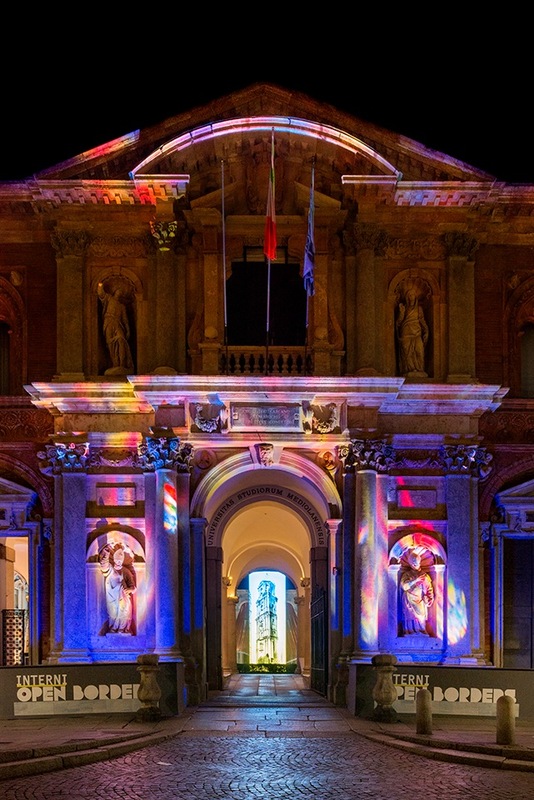 The light is white, to not superimpose itself on the color of the historic building, and to highlight the entrance to Open Borders. 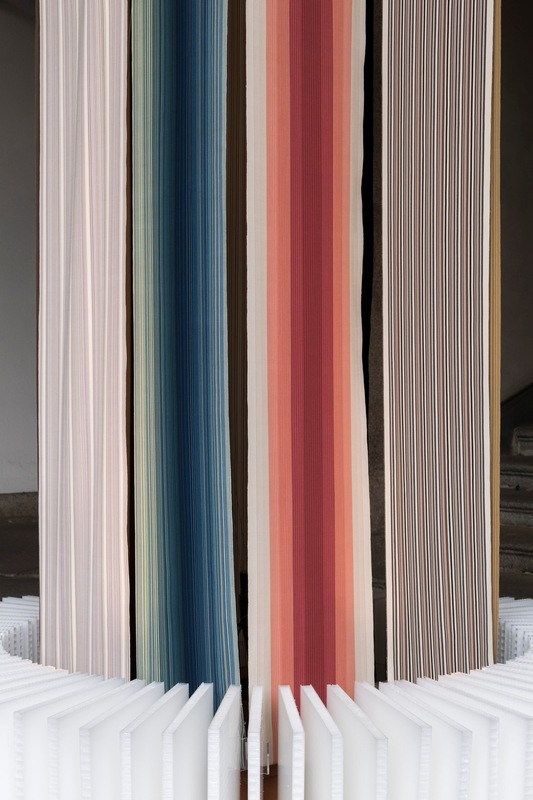 Parabolic Stripes was composed of three creations in the traditional Japanese vertical striped fabric (Kokura Stripes): a volume with a rectangular section in front of the statue of St. Ambrose; a column with the cylinder divided into four parts; a chandelier positioned in the vault of the staircase. 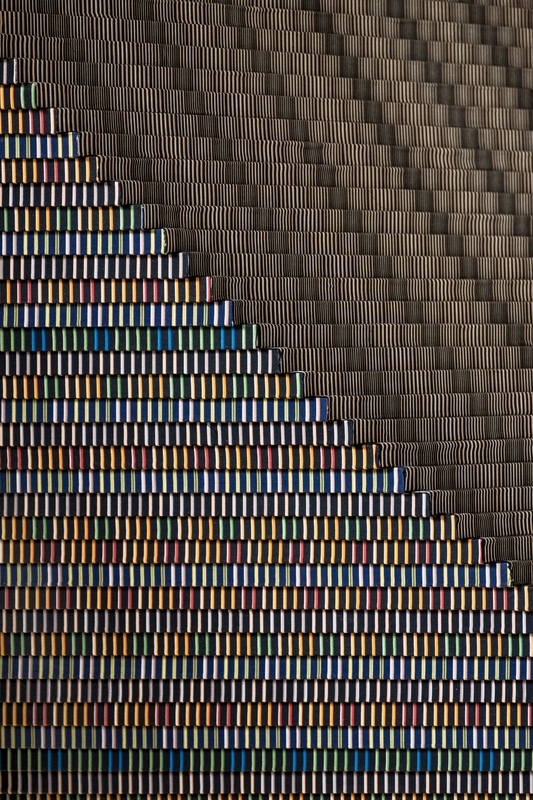 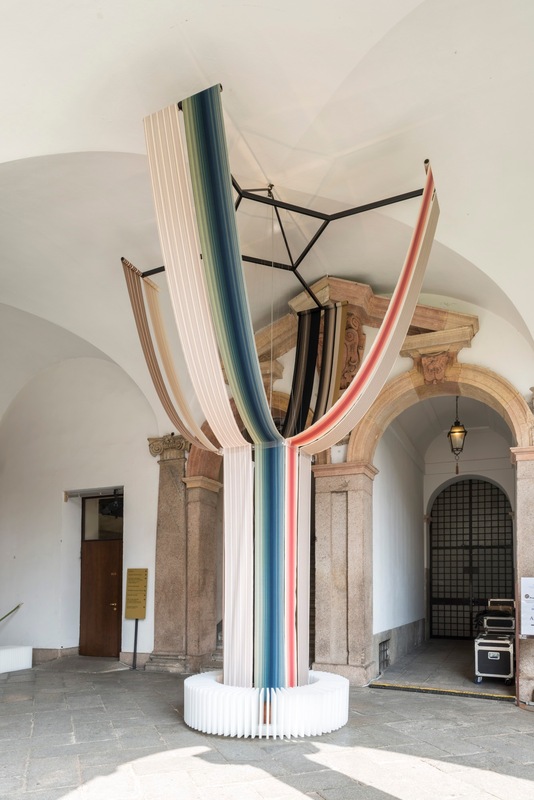 The installation was made by Kokura Stripes Japan Association, which promotes the spread of the traditional striped fabrics, and with the collaboration of the textile company Shima-Shima. 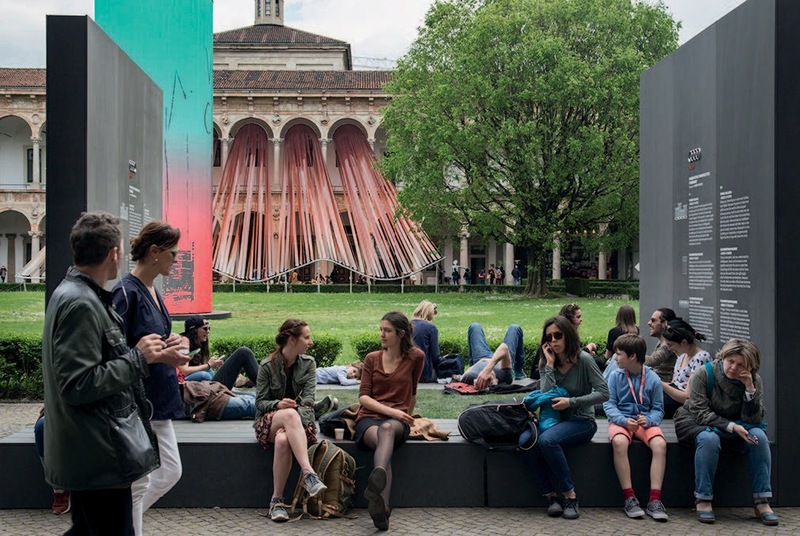 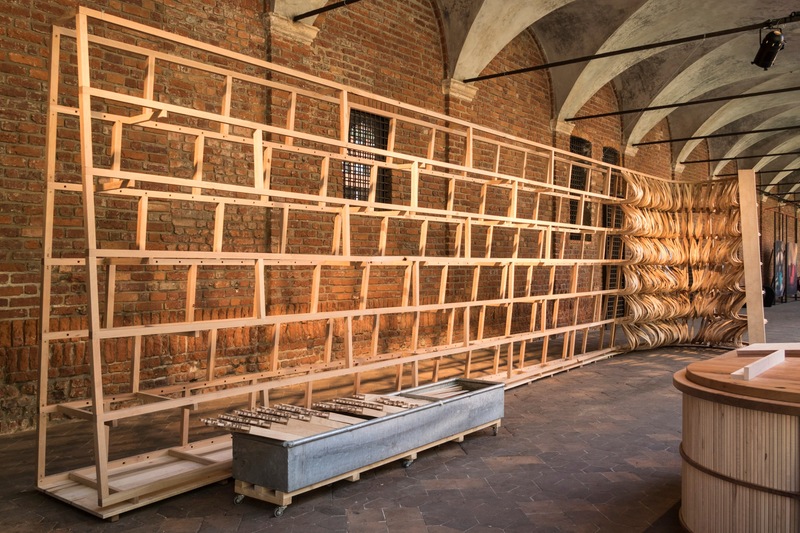 In the Cortile d’Onore, an installation that was a tribute to the Salone del Mobile.Milano, which reached its 55th edition in 2016. 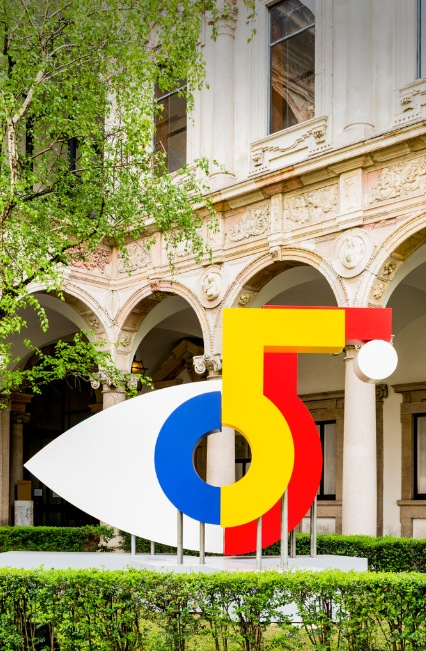 The three-dimensional composition presented the new image of the Salone, created by Lorenzo Marini, extending between past and future: a blend of the number 55 and the eye, the first symbol used by the Salone in 1961. 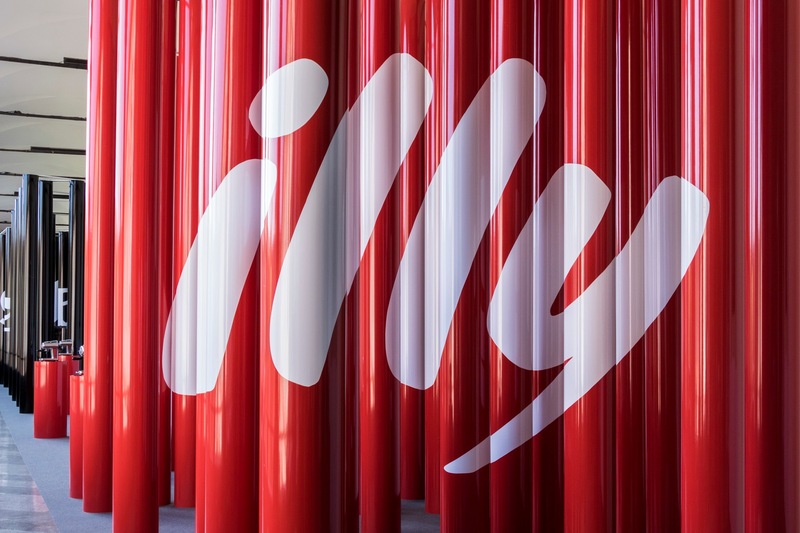 To mark an important point of arrival for the Milanese fair. 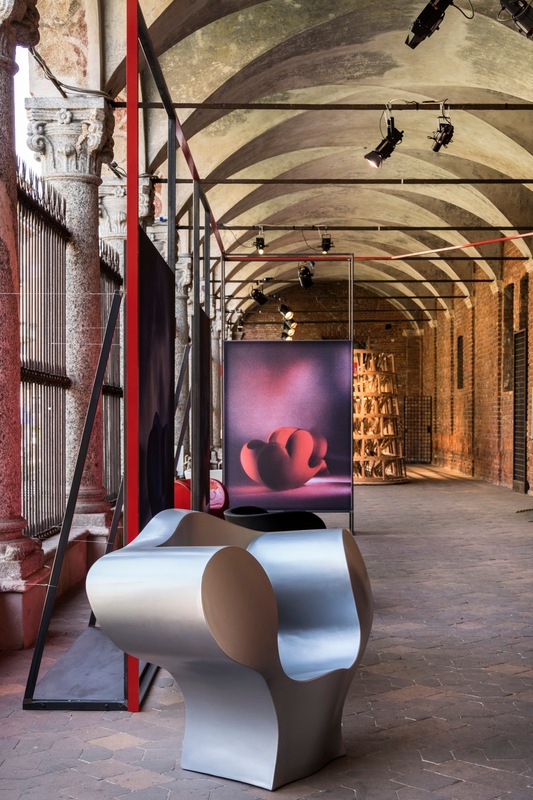 The exhibition was the result of the desire of Patrizia Moroso to celebrate a path that began over 20 years ago, when Tom Vack photographed the first products Ron Arad had designed for the company. 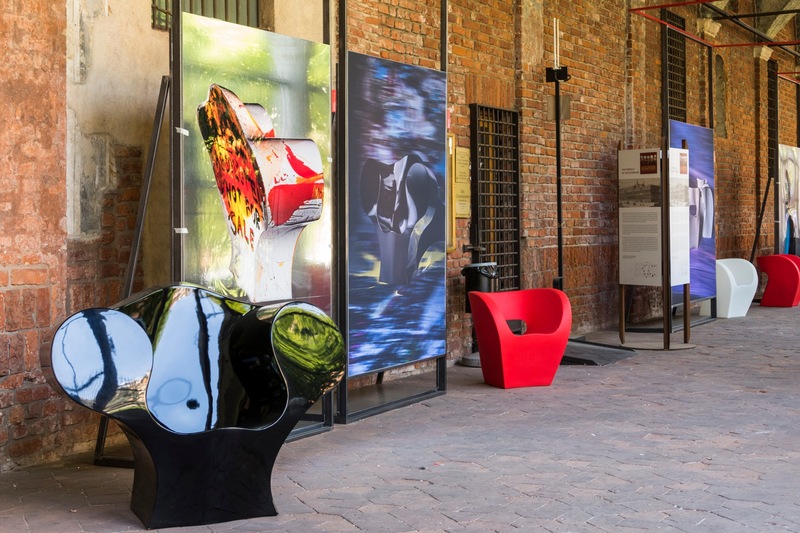 The exhibition gathered 20 life-size photographs in Portico Richini taken by Vack and showing products by Arad for Moroso, some of which were placed next to the images. 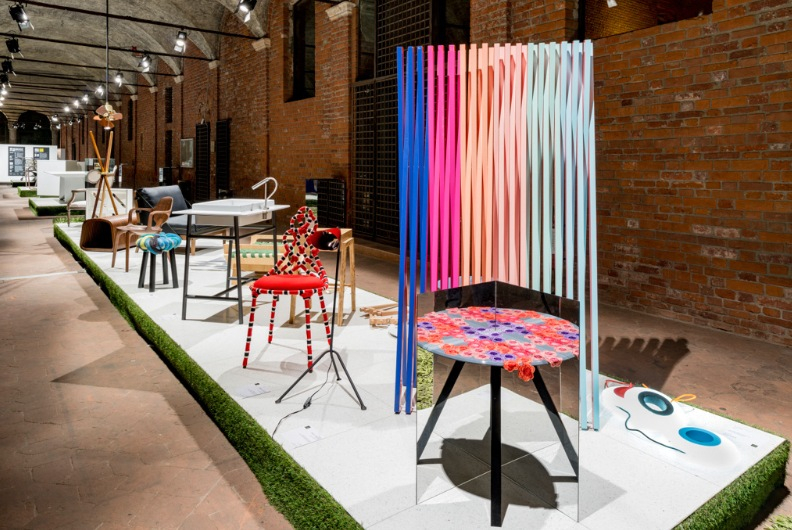 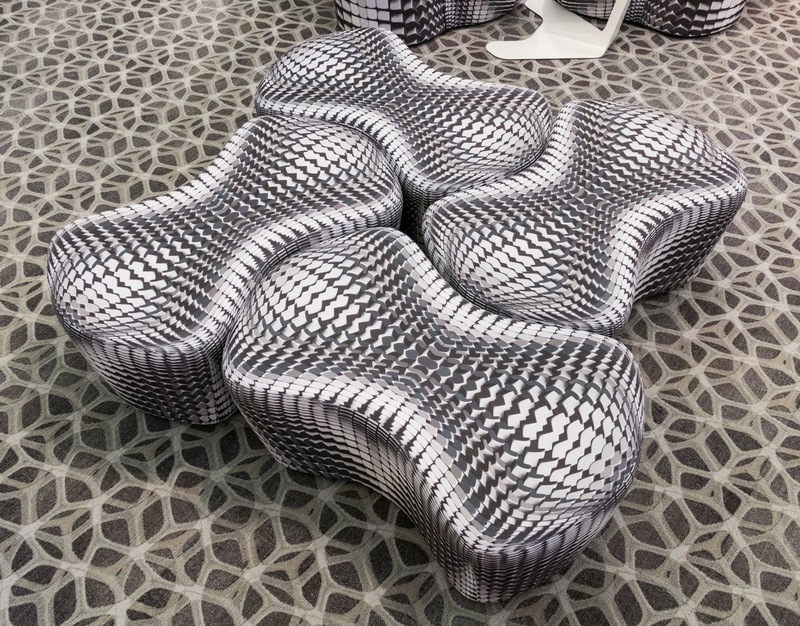 The show, produced by Moroso, was installed by the architect Ester Pirotta. 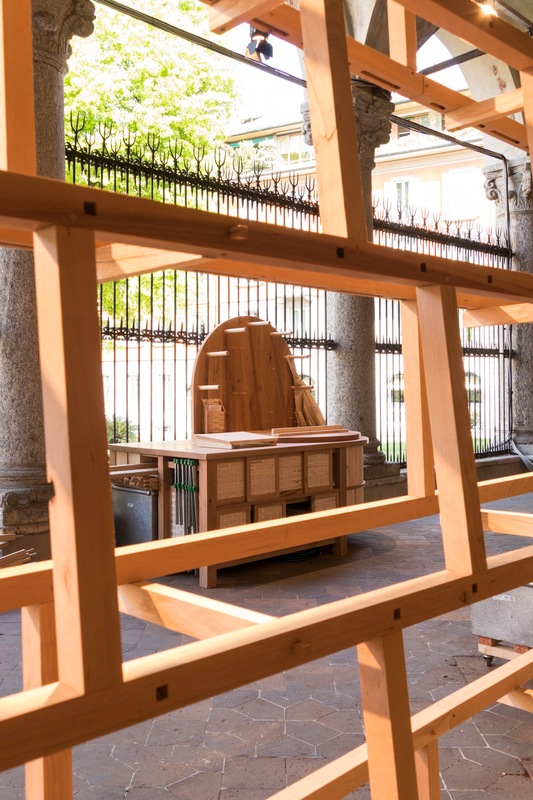 Scorched or Blackened, the pavilion supported by the Umbria Region and created by Paolo Belardi with the “Accademia di Belle Arti Pietro Vannucci di Perugia” was located in the portico of the Cortile d’Onore. 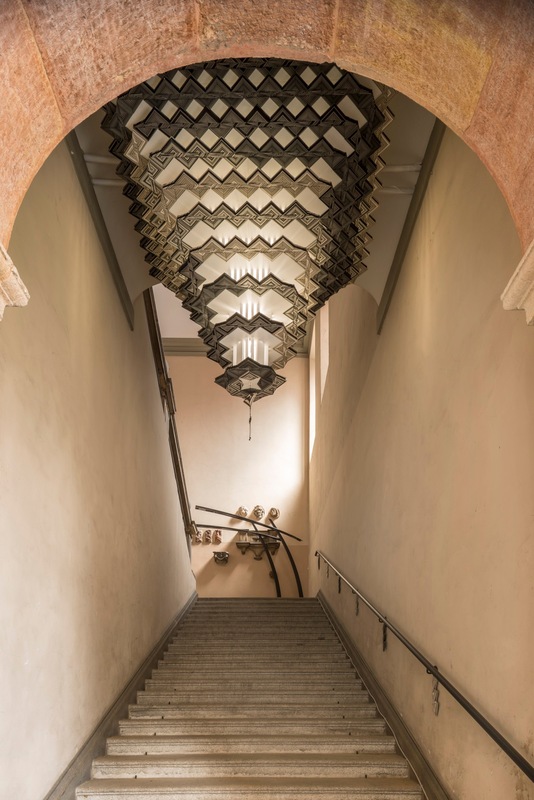 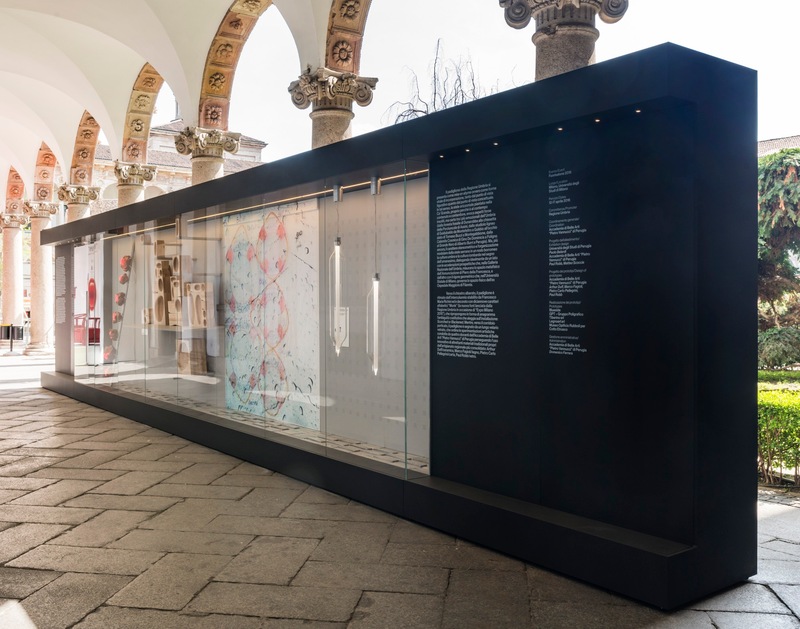 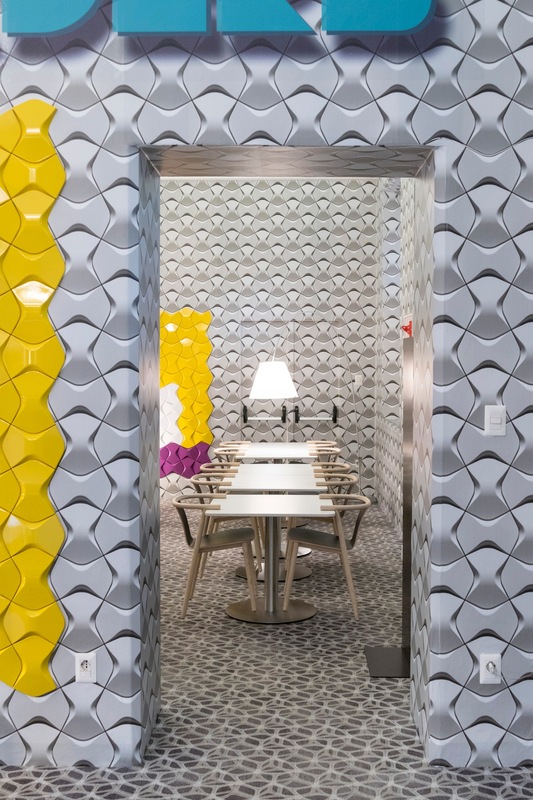 The pavilion, displaying four experiments with the materials of Umbrian crafts (ceramic, wood, paper, glass), had an outer wall decorated with a pattern of characters using Monk, the new font launched by the Umbria Region for Expo Milano 2015. 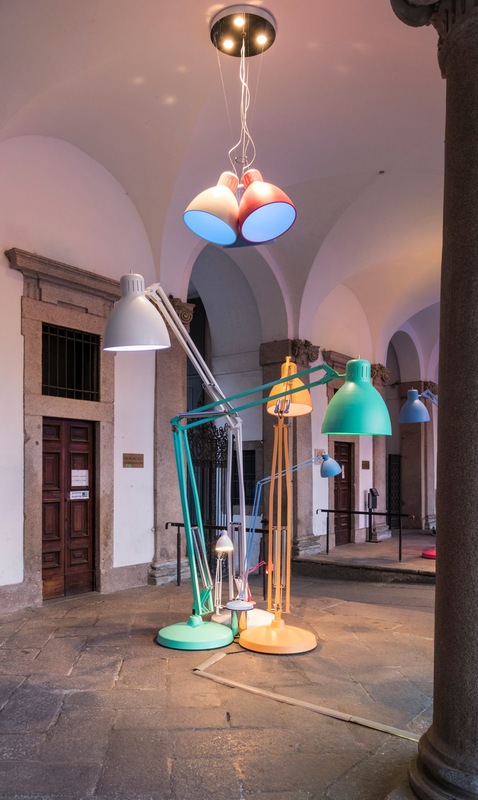 In the entrance portico of the Cortile d’Onore, groups of Great JJ floor lamps produced by Leucos in innovative colors, specifically for Open Borders. 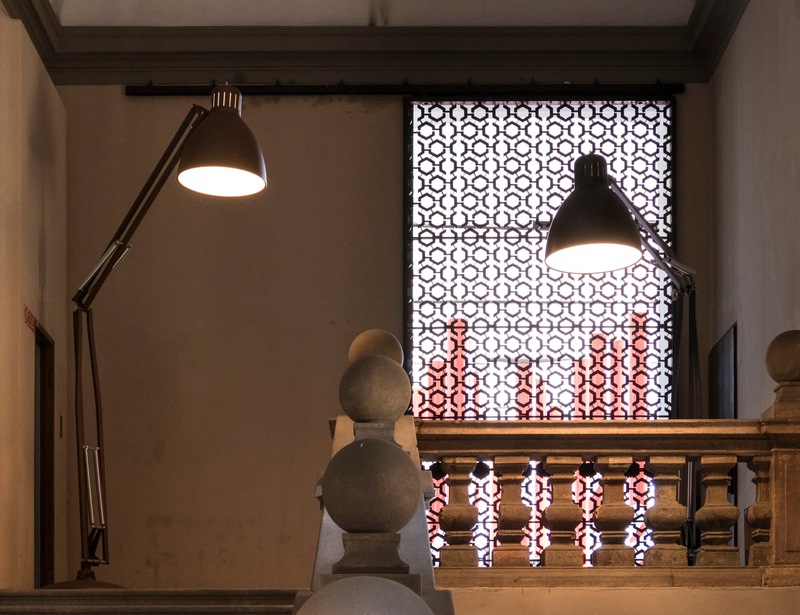 Other groups of three shades of the Great JJ model replaced the suspension lamps of the portico. 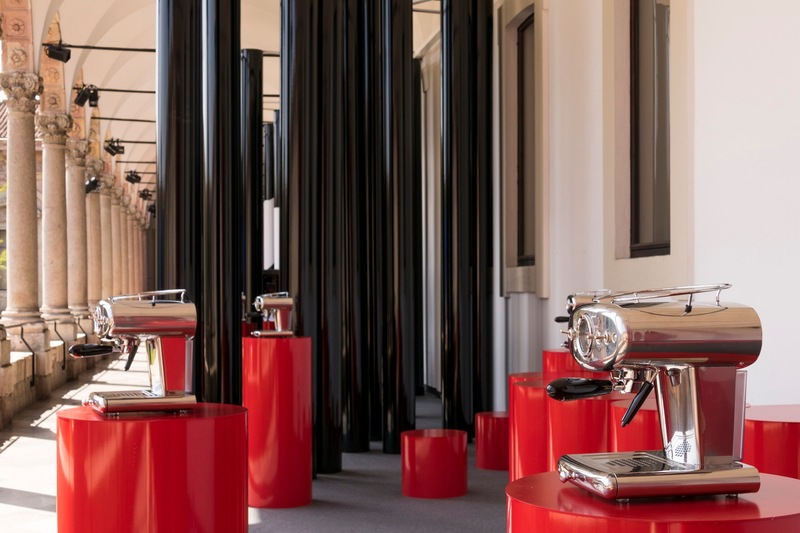 The West Loggia contained the exhibition ‘X1: the Story of a Family Passion’ created by Carlo Bach for illy; amidst red and black columns, the coffee machines that have made the history of illy: illetta, the forerunner, created 80 years ago; the X1, now twenty years old; and finally the X1 Anniversary Edition, the new model that combines features of the two ‘historic’ machines. 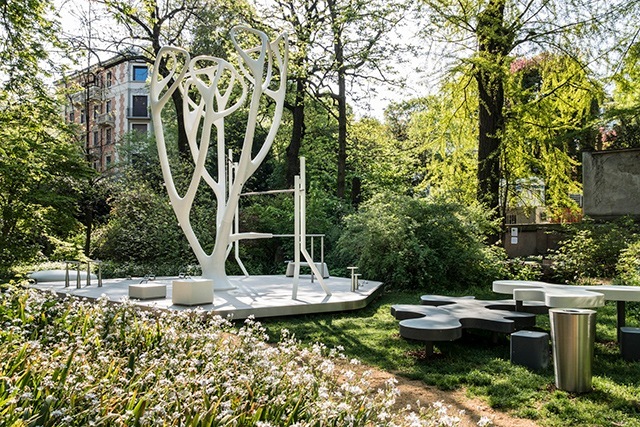 MyEquilibria, The Wellness Park, is a project to encourage urban fitness, where design and high technology combine to create an innovative outdoor gym. 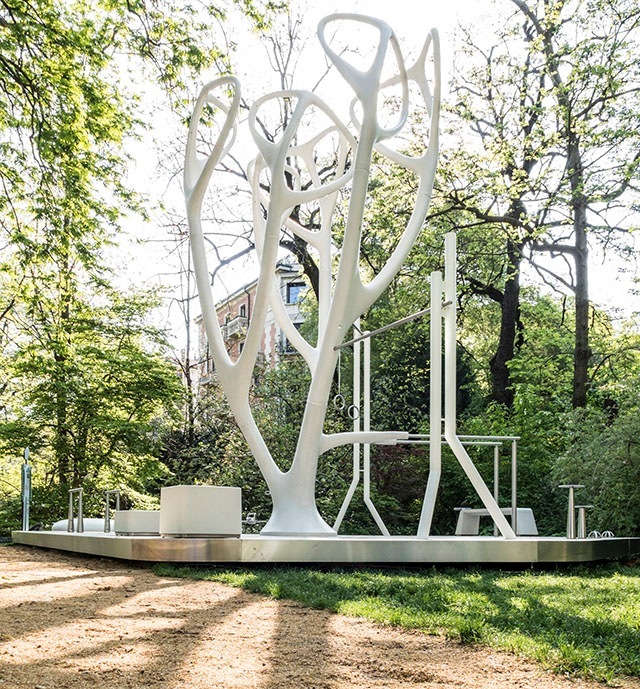 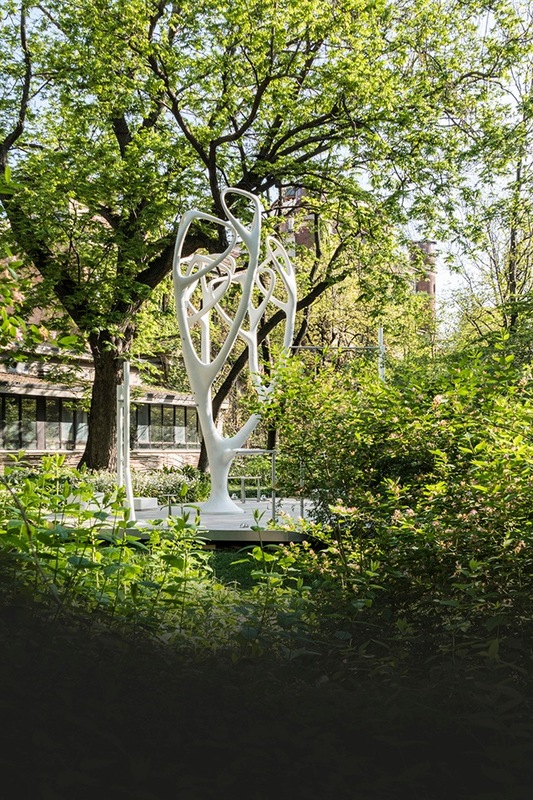 MyEquilibria, by Vito Di Bari for Metalco Active, is an innovative outdoor gym: the central tree, 7 meters high, in high-performance cement, can have up to 9 satellite islands, where up to 30 persons can exercise. 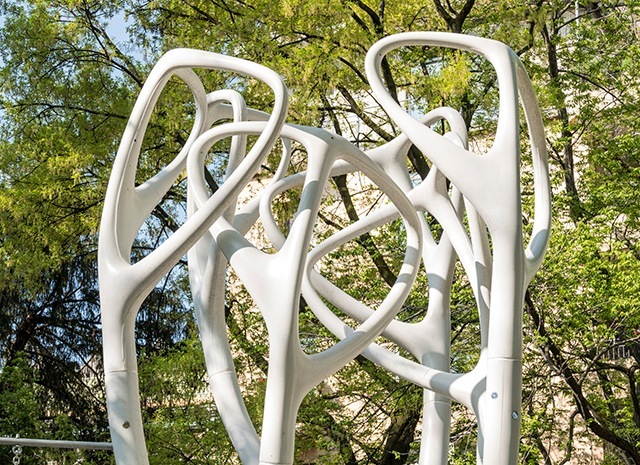 An app suggests the best exercises and permits socializing with other users. 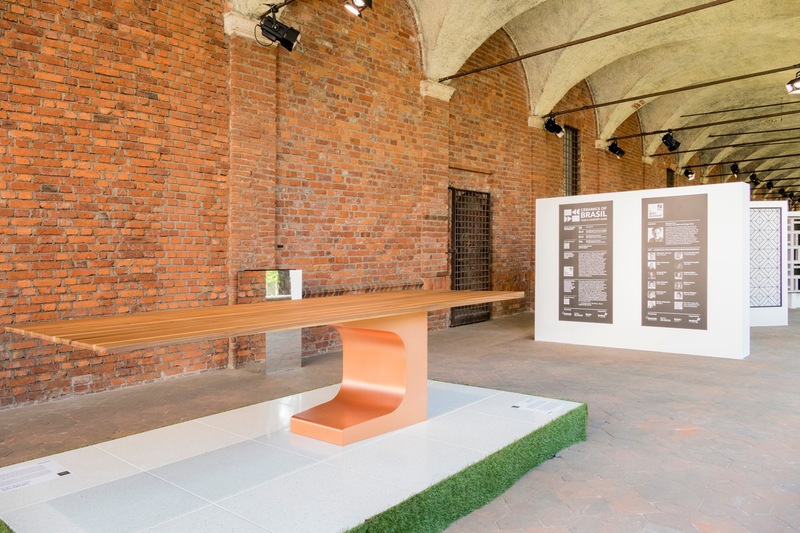 On the facing page, below, the Natural Puzzle bench by Metalco Active, in reconstructed granite and marble, designed by Pio & Tito Toso.